Nagavara Ramarao Narayana Murthy, better known as N. R. Narayana Murthy, is an Indian industrialist and software engineer. He is the Founder of Infosys Limited, a global software consulting company headquartered in Bangalore, India. He founded Infosys in 1981, served as the CEO during 1981-2002, and as the Chairman and Chief Mentor during 1981-2011. Under his leadership, Infosys was listed on NASDAQ in 1999. He is currently the Chairman Emeritus of Infosys. Mr. Murthy articulated, designed and implemented the Global Delivery Model which has become the foundation for the huge success in IT services outsourcing from India. He has led key corporate governance initiatives in India. He is an IT advisor to several Asian countries. He serves on the boards of HSBC, Ford Foundation, Rhodes Trust, the Indian School of Business and the UN Foundation. He served as a member of the Unilever board between 2007 and 2010, the Chairman of the International Institute of Information Technology, Bangalore between 2002 and 2012 and the Chairman of the Indian Institute of Management, Ahmedabad between 2002 and 2007. He has also served on the boards of Cornell University, Singapore Management University, INSEAD (Paris), Wharton School and the Graduate School of Business at Stanford University. 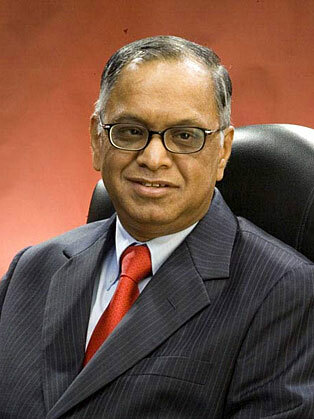 Mr. Murthy was listed as one among the “12 greatest entrepreneurs of our time” listed by the Fortune magazine in 2012. The Economist ranked him among the ten most-admired global business leaders in 2005. He has been awarded the Padma Vibhushan by the Government of India, the Legion d’honneur by the Government of France, and the CBE by the British government. He is the first Indian winner of Ernst and Young’s World Entrepreneur of the year award and the Max Schmidheiny Liberty prize. He has appeared in the rankings of businessmen and innovators published by BusinessWeek, Time, CNN, Fortune, India Today, Business Standard, Forbes and Financial Times. He is a Fellow of the Indian National Academy of Engineering and a foreign member of the US National Academy of Engineering. He was awarded the 2012 Hoover Medal. He received the 2007 Ernst Weber Medal from the Institute of Electrical and Electronics Engineers, Inc., USA (IEEE). He has about 25 honorary doctorates from universities in India and abroad.